Their debut album wasn't even on store shelves when Lady Antebellum got the call that they were nominated for the Academy of Country Music's Top New Vocal Group award. They were only on their first single when they won it. Still, the accolade was no surprise to Nashville, as this trio is what many consider the biggest buzz band to come out of Music City in years. Even with their almost instant success, Lady Antebellum -- Dave Haywood, Charles Kelley and Hillary Scott -- sure don't seem green. The fresh-faced 20-somethings stroll into our studios after a whirlwind media tour. As exhausted as they are, they have everything down to a science, from their flawless vocal choreography to finishing each other sentences in our interview. After their impressive Sessions performance (watch it here), The Boot talked to the three friends about everything from life on the road to celebrity crushes. 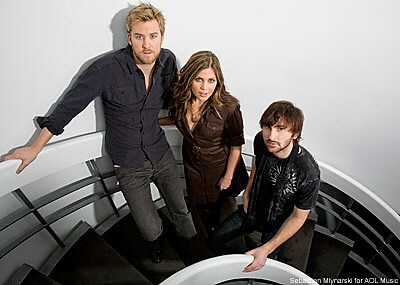 Plus, we get the scoop on how the evolution of Lady Antebellum started with what you might call a musical pickup line. Tell us the story about how you all met. Charles: Dave and I are both from Augusta, Georgia, so we've known each other since middle school. We both moved to Nashville about three years ago, and then we ran into Hillary out at a Nashville spot. Dave: But it worked on him! Charles: And then we got together, started writing songs and ended up starting the group. Think back to your first writing session together. Did you have any idea that you would end up forming a band? Dave: We never did actually. The very first day that Hillary came over, we were working on a song called 'All We'd Ever Need.' But we never even thought about it until we had written 5, 6, 7 songs. Then we played our first show, and we all enjoyed it so much. We felt like it was something a special and different. So from there we decided to do Lady Antebellum. 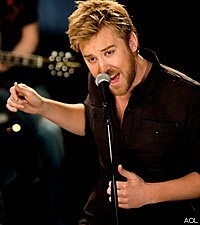 Charles, I understand Lady Antebellum's first single,'Love Don't Live Here,' was inspired by a breakup you had? Charles: [laughs] I think all of us relate to it a little bit. Hillary: Who hasn't been in a s----y relationship? Charles: Yeah, we just wanted an angry kiss-off song . . I guess that's a nice way of saying it. You guys have been compared to everyone from Little Big Town to the Eagles. What do you think is the most accurate comparison? Charles: We've been influenced by everything. We listen to all kinds of styles of music -- we never went in, when we started writing, to try to create a sound. 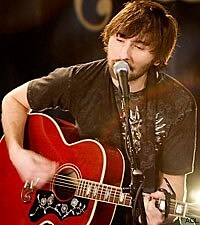 We never said, 'Alright, we're going to write a country song. We're going to write an R&B song.' We wrote whatever came out and it kind of came out of all our influences. Dave: But Usher, if we had to pick one. Charles: [laughs] We sound just like Usher! Charles: Or 50 Cent with a country twang. So you're indisputably unique, which a lot of people say is the secret to your success. What makes you unique? Charles: Obviously the two of us, Hillary and I, trade off lead vocals equally. I know there are a lot of vocal groups out there where there is a lead singer and the rest harmonize, but we-we trade off equally on lead vocals, so I guess that's kind of a unique thing. Hillary: And we're all really tall! A lot of people we meet, we tower over, because Charles is 6'6", Dave's 6'2" and I'm 5'9" -- 6'1" in heels! Dave: The tallest group in country. Hillary: There's a height requirement if you want to be the fourth member. Dave: Yes, we need another girl! Hillary: [laughs] They're sick of me, obviously. So let's say there had to be a fourth member and you could choose anybody. Who would you choose? Dave: Carrie Underwood could come in, if she ever wants to kill the solo career. Charles: I don't know if Rachel McAdams is a singer, but if she'd like to join our group . . . she could play the tambourine, if nothing else. Charles: I have a crush on her, there's nothing wrong with that. Think back to when you heard you were nominated for the ACM's Top New Vocal Group. What went through your minds? Dave: It was actually 7 in the morning on a Tuesday. We woke up to a text message about the ACM nomination. It felt so surreal. I mean, it was so early in our career. Everything was happening really fast. Hillary: Our record wasn't even out yet! Charles: I think we all don't quite feel deserving of it, but we'll certainly take it. It's pretty flattering. Hillary: It's a really humbling feeling . . . and it's an excuse to go to Vegas! Any other surreal career moments so far? Hillary: Probably for me was the first time we played the Grand Ole Opry. That was an amazing opportunity -- there's so much history there. Just thinking of all the people who stood there before you and who you're sharing the stage with. Bill Anderson, a legend in country music, introduced us our first time on the Opry and then Vince Gill another time, who's one of Charles' biggest influences. It's just a religious experience every time you go. You definitely feel the spirit of country music. u always know you wanted to be a singer? Hillary: I wanted to do anything but be in the music business when I was really young, because I traveled with my parents for two years in kindergarten and first grade. I was home schooled -- I watched school on video tape in the bus while my mom was touring, opening up for George Strait and Garth [Brooks]. And then my parents got a job touring with Reba [McEntire] for eight years. My mom and dad both sang background vocals for her, and so they were gone a lot, which was really difficult. So I wanted to be a vet, a nurse, a chef -- I mean, anything but the music industry. But once I hit high school, the bug really bit me. You can't deny where you come from and what's in your genes, and music definitely was. I haven't looked back since. You guys have been rubbing elbows with a lot of big names. Ever been star struck? Hillary: We went to the BMI Awards, and Kris Kristofferson was there, and he is such a presence anywhere -- any room he walks in. It was just amazing to be in his presence. And he looked at us and he said, 'I'm going to be saying that I remember when I met them at BMI.' I mean, we were so honored to meet him! It was really, really cool. Charles: Also, we also got to sit at the table with Keith Urban and Nicole Kidman - that was pretty surreal. I probably creeped her out. I kept looking over, and then I'd eat a little bit, and then I'd look over again to see what she's doing. Dave: She sure looks perfect and beautiful, doesn't she? Hillary: It's like staring at a porcelain doll. She's absolutely stunning. Dave: We also saw the Eagles at the CMT Awards. They're a big influence of ours, and I personally was freaked out and couldn't go talk to them. Charles went and talked to them, but I couldn't do it. Maybe next time. Hillary, what's the best part and the worst part about being the only girl in the group? Hillary: The best part is I've got eight guys around me -- including our band and tour manager -- who take care of me all the time, make sure that I'm protected. And there's really no drama. Guys are really easy to get along with. It's a lot better than being on the bus with eight girls. But the worst part is being the only girl, because there's some days where you just wanna watch a chick flick. Dave: We can watch chick flicks! Charles: I'll totally watch 'My Girl' with you anytime. Hillary: But it gets frustrating when they leave the seat up in the bus. My only requirement is keep the seat down, and we'll get along great. Seat up, not so great. Hillary, you have such great chemistry with both Charles and Dave, it's hard to believe you're not dating one of them! Hillary: Well now we actually would like to let the world know . . .
Dave: We'd like to make an announcement . . .
Hillary: No, we really are best friends. I can talk to them about anything in the world. But they are pretty protective of me, too. They're like, 'What are you doing talking to that guy? What does he want? What does he do? Does he have a job?' You know, all that big brother stuff. So it's great, I get friends and brothers at the same time. So are all three of you single? Hillary: Yep, none of us are married! Dave is really single. Dave: Why am I really single? I don't understand what "really single" means. Hillary: Well, he's the one who's on dates more than any of us. Dave: Oh, I can't help that! Charles: Where is this going? Dave: Take that out of the interview! Who's the biggest flirt with the fans? Dave: All I do is throw my guitar picks out . . . and they're like little fish in a bowl grabbing the guitar pick. Charles: Fish in a bowl, what is that? Dave: You know when you feed a fish and they get all . . .
Charles: Wow! Women will get really offended by that. Gosh, cut that out too. Charles: Dave's a flirt, he is. Hillary: And I'm the one who'll talk forever to somebody, and get their whole life's story, and hug them and love on them. Hillary: Get your minds outta the gutters, bullies! That's another thing about being on a bus with boys. Their minds are in the gutter a lot. Who's the moodiest of the three of you? Charles: Really? Come on, you can get a little moody, as well. But yeah, I'll own up to that. Sometimes I just want a little me-time. Sometimes I just wanna rock out. Hillary: He is really an intense person and very passionate about what we're doing. But it makes him who he is. So, you gotta love all of somebody if you're gonna love them. Charles: You gotta "love on them." Who's the primary decision maker? Charles: That's tough to say. Dave: When we started the group, that was one of the main things -- We wanted to make sure it was an equal partnership between the three of us. Charles: I think, legally, we had to pick titles and I'm the secretary, Dave is the president, and Hillary's the vice president. Hillary: Which doesn't make any sense. Charles: Just something for the government. Hillary: Me? You're loud, too . . . When we were out on radio tour, we basically were visiting all the major cities in the country and some of the smaller ones, too, so we had a lot of car time. And Charles' past time would be to start free-styling about whatever is happening. Like, [rapping] "We're rolling down the road and . . ."
Charles: Stop! Stop there. See, she won't stop talking. You see, now who's the loudest? Dave: If you're measuring decibels though, Charles is. Charles: That's because I've got a lot of girth. Charles: A lot of lung capacity! I don't know where we're going with this. Y'all are gonna have to make a lot of edits to this [interview].